Students relax with their friends on our two Quads—our campus living rooms. 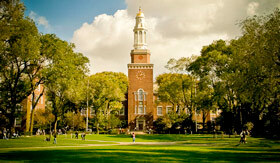 Share the pride of being a Brooklyn College student. Opportunities for students to exchange ideas are plentiful. Our brightest scholars win national awards. 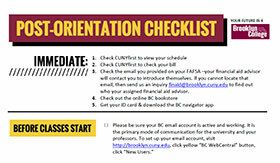 Orientation is special day for every new student—it's your formal introduction to Brooklyn College. You will receive information about academic and support resources, advice about how to successfully transition to college, and meet with an Academic Advisor to discuss enrollment for the upcoming semester. Orientation is just the start of your academic career. We look forward to seeing you on campus! Orientation is mandatory for all students! 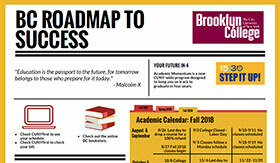 Download your roadmap for info about the academic calendar, First College Year events, BC offices you can use for academic and life support, and more! A brief outline of the day's events. We have the answers! 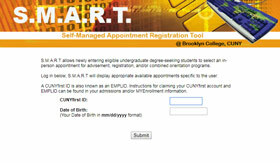 Check out our Orientation FAQ. Need help with anything at all? 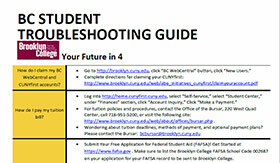 Check out all the resources Brooklyn College has to offer. 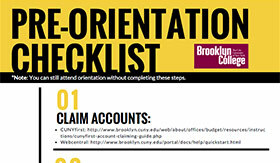 After Orientation, use this handy checklist to make sure you have everything ready for the fall semester.